During September 2004 a salvage excavation was conducted in Shikune Nuessiba at Beit Hanina (Permit No. A-4251*; map ref. NIG 22063–80/63748–68; OIG 17063–80/13748–68). 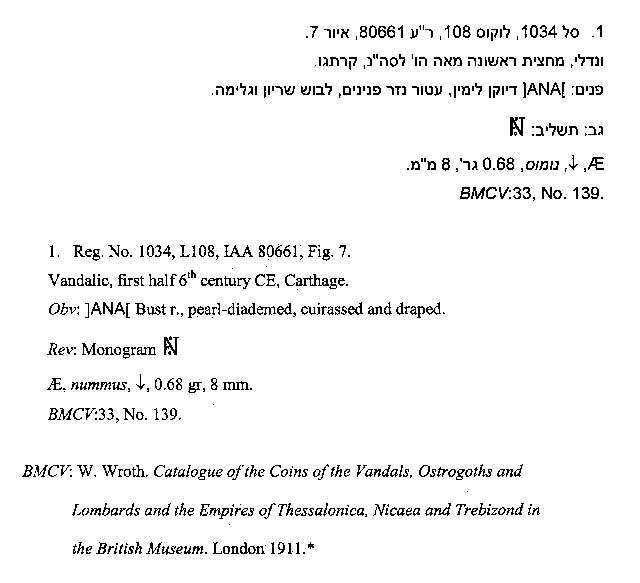 The excavation, on behalf of the Antiquities Authority, was directed by Y. Mizrahi, with the assistance of V. Essman and V. Pirsky (surveying and drafting), T. Sagiv (field photography), C. Amit (studio photography), C. Hersch (pottery drawing) and G. Bijovsky (numismatics). 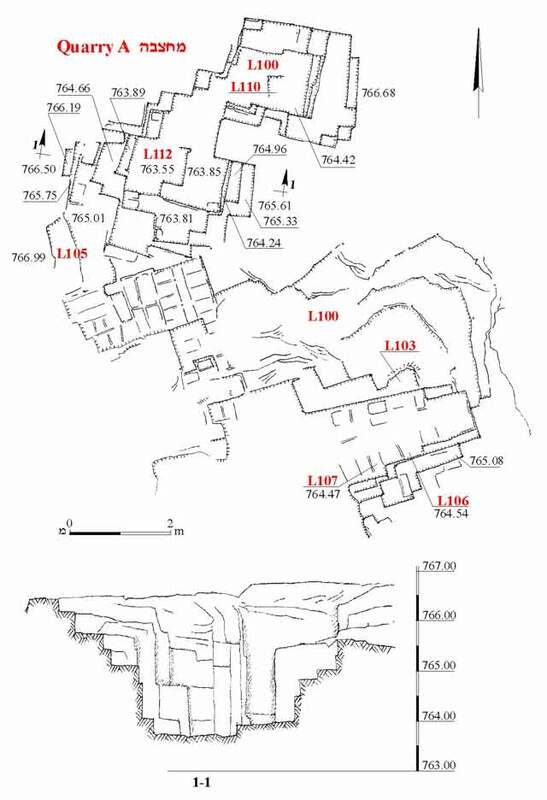 The excavation was carried out in three quarries (A, B, C); Quarry A was c. 8 m distance from Quarry B and the latter was c. 4 m from Quarry C.
The western quarry (14 × 17 m; Fig. 1) was composed of three step quarries; between the two northern quarries (Loci 110, 112) was an unworked area. The northwestern terrace (L112; 5 × 6 m) had five steps and in the northwestern corner was an undetached stone. The northeastern terrace (L110; 3.5 × 4.5 m) had six steps and the third step quarry in the southeast (L106; 4.0 × 4.5 m) had four steps. A hewn area between the northern and southern step quarries had indications of using explosives, which was a common quarrying method during the nineteenth and twentieth centuries CE. Ancient rock-cuttings had probably existed in this area, although the modern quarrying activity eradicated any trace of them. On the floor of the quarry were fragments of pottery vessels from the Byzantine period, such as a bowl (Fig. 2:1). The main quarry (Loci 104, 108; 8 × 12 m; Figs. 3, 4) was a large courtyard quarry, composed of a single progressively hewn cavity. A niche in the eastern corner that protruded into the quarry’s area had been created when the corner was only partly cut away. The area of the quarry became narrower from step to step, down to the level of the floor (3.4 × 5.5 m). 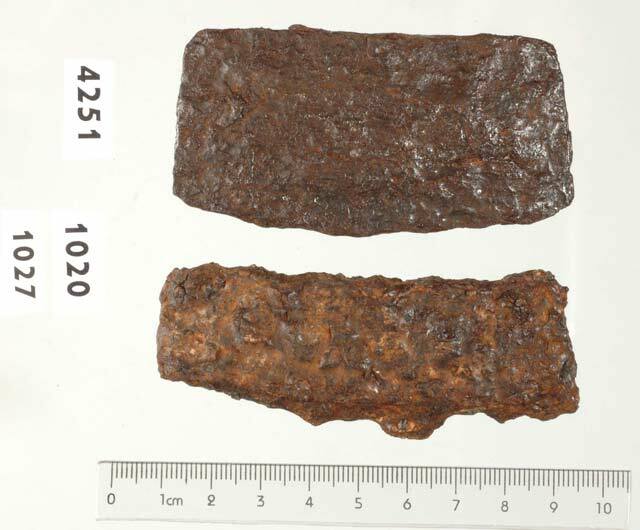 Among the finds recovered from the floor of the quarry were two iron adzes (Fig. 5), a jar from the Byzantine period (Fig. 2:2) and two tiny bronze coins that dated to the first half of the sixth century CE. 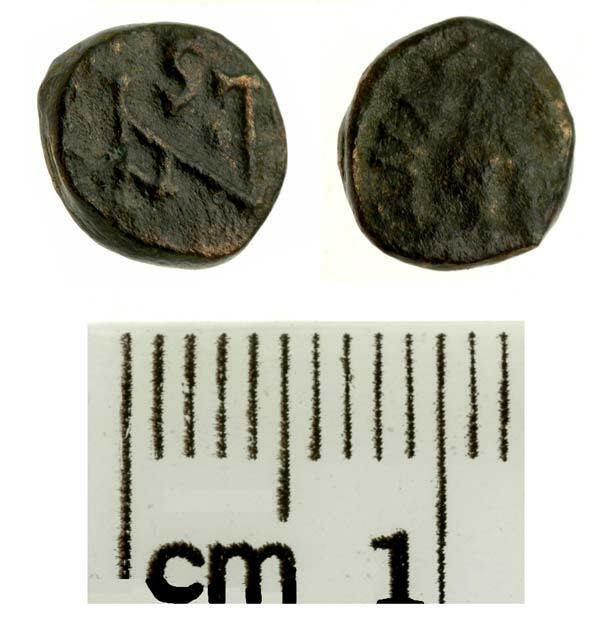 One of the coins (IAA 80662) is quite worn and the other is a Vandal nummis that was minted in Carthage and has a monogram on its reverse side (IAA 80661; Figs. 6, 7). The northern and smallest quarry (L102; 4.2 × 7.0 m) consisted of four steps. The second, third and fourth rows of stones were only hewn on the southeastern part of the quarry, so that the work area became smaller toward the bottom of the quarry (second step 2.3 × 2.4 m; fourth step 1.0 × 1.9 m). 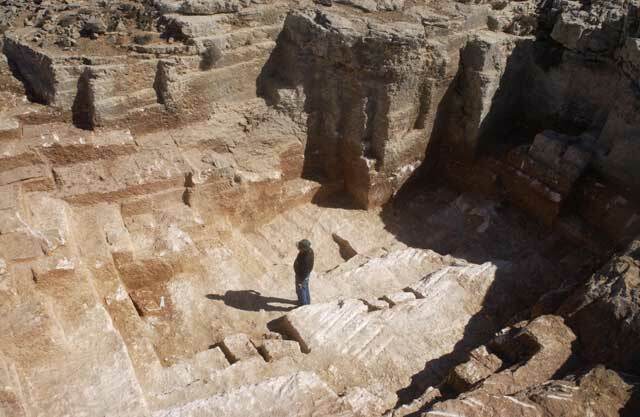 Judging by the severance channels, it is estimated that over one hundred stones (presumed stone size 0.35 × 0.65 m) were removed from the quarry. Detachment marks around the removed stones show that many of them were damaged. The signs of severance channels and the diagonal grooves that appear on most of the quarries’ sides indicate that rock-cutting was accomplished by chiseling severance channels around the stone. Thereafter, when the stone was mostly detached, an iron bar was used for its final extraction, as evinced by the two iron axes recovered from the quarry. A white layer discovered on top of bedrock in all the quarries was debris from rock-cutting and stone dressing that indicated the latter was performed in the quarries themselves and not at the construction sites, thus avoiding the transportation of crude and heavy stone blocks. 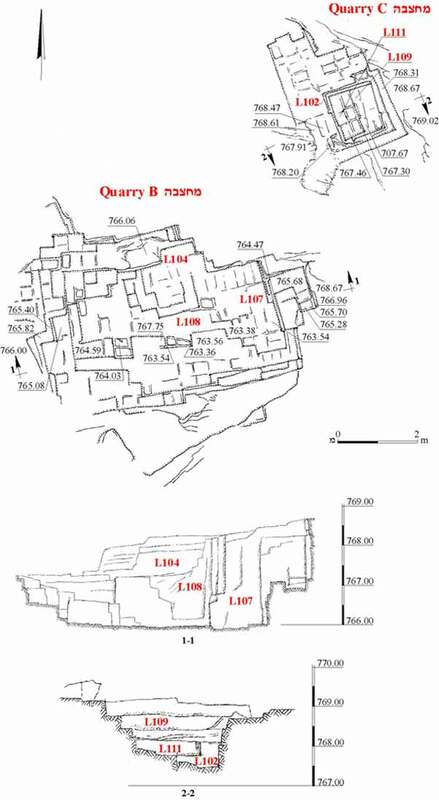 The ceramic finds show that quarrying activities occurred in Quarries A and B during the Byzantine period and it seems that Quarry C was used in this period as well. The signs of explosions in Quarry A indicate that the quarry was used in recent centuries. 1. Quarry A, plan and section. 3. Quarries B and C, plans and sections. 4. Quarry B, looking northeast.